STEUBENVILLE — In the midst of another tough stretch, veteran Big Red baseball head coach Fred Heatherington wanted to see more energy from his team in its second game to cap a tri at Vaccaro Field on Saturday. He got his wish, as Steubenville battled back after squandering a pair of leads to defeat John Marshall, 7-6, to earn the split on the day and go to 8-5 on the season. Catcher Clayton Criss provided the winning run in the bottom of the sixth, getting hit by a Jacob Korngiver pitch to reach base and eventually score on a wild pitch to break a 6-6 tie. Ethan Duggan — the last of three pitchers to combine on the mound in the winning effort for Big Red — worked around a two-out single to shut the door on John Marshall in the top of the seventh and seal the victory. He struck out one, while throwing the final 2 2/3 innings and did not allow a run. Dylan Cunningham started on the mound and went the first 2 2/3, allowing four runs, while Luke Zorne recorded two outs in between. Hayden Savage provided the first offense of the game in the second inning, plating Criss with a sacrifice fly to center field. That run came after the Monarchs (7-13) left the bases loaded in the top half of the second, and left two on in the first. “It was tough,” John Marshall head coach Mark Cisar said. “We gave up a lot of free runs. It starts with a lot of base on balls. They were taking bases on balls in the dirt. We left guys on base. We had 11 hits and only six runs. It was a lot of stuff we have to a better job at. John Marshall was able to take advantage of runners on base in the top of the third to take its first lead, as Josh Schramm plated a run with a double, and Derrick Black drove in two more with a single and Reed Wiley made it a four-run inning with an RBI single to make it a 4-1 John Marshall lead. Big Red, though, answered right back. 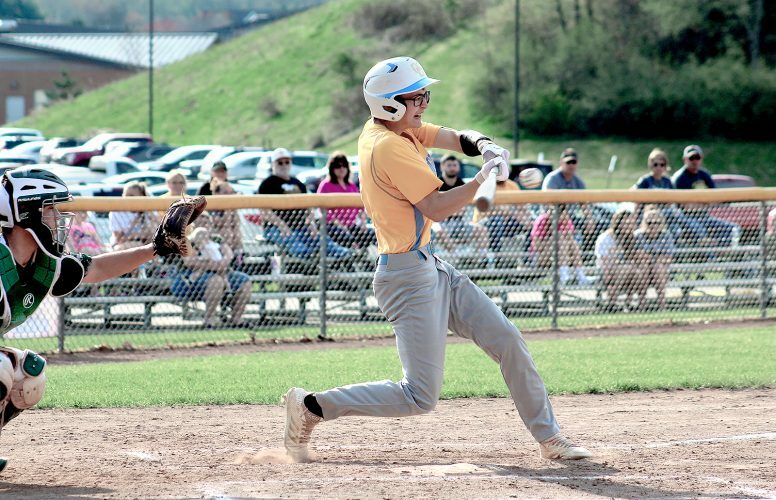 Criss drove in a run with a sacrifice fly to center, then Calvin Bickerstaff stepped to the plate with the bases loaded and did not leave them that way, clearing them with a three-run triple off the fence in deep center, making it 5-4 Steubenville. The Monarchs added two runs in the fourth to retake the lead, one coming on an RBI by Schramm, but it was also short-lived. Criss drew a walk with one out in the bottom half, then scored on Savage’s single for his second RBI of the game. The score remained that way until Criss’ game-deciding run in the sixth. John Marshall hosts Magnolia on Monday. Big Red is back at Vaccaro Field to host Edison on Tuesday. In the opening two games, Cambridge shut down both Steubenville and John Marshall. In the first game, the Bobcats defeated Big Red, 7-1, thanks to a five-strikeout performance from Trent Valentine. 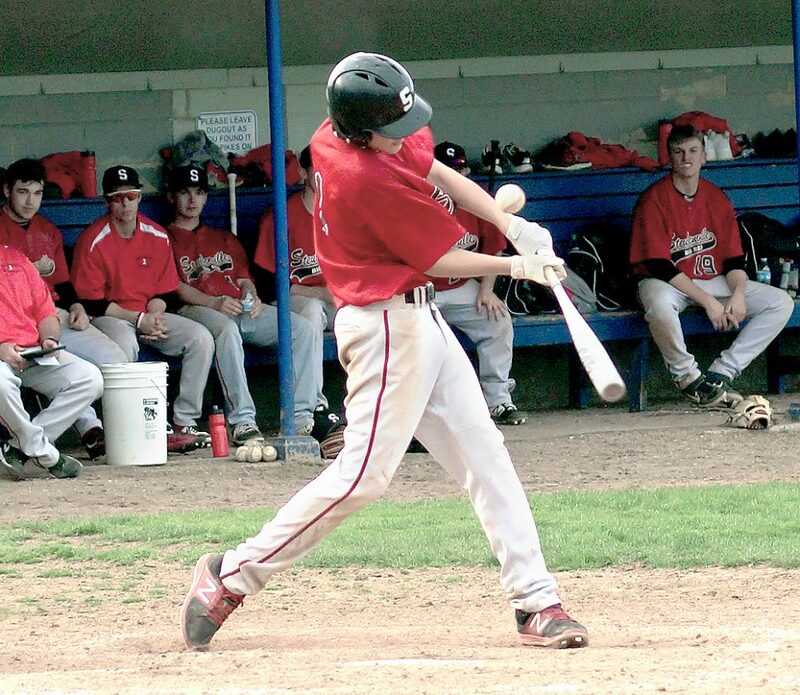 Niko Kausky had a double and the lone RBI for Steubenville, while Criss also doubled. In the second game, Cambridge’s Sean Perkins threw a no-hitter in a 10-0, five-inning mercy rule win over the Monarchs. Cambridge, now 8-5, hosts River View on Monday. CAMBRIDGE: T. Valentine (WP, 6IP, 1R, 1ER, 6H, 5K, 3BB), Tuttle (1IP, 0R, 0H, 0K, 0BB) and Brumfield. STEUBENVILLE: Sutton (LP, CG, 7R, 4ER, 14H, 2K, 1BB) and Criss. TWO OR MORE HITS: Cambridge (Hollins 2, Tuttle 3, Moore 2, Whaley 2, Nunamaker 3); Steubenville none. DOUBLES: Cambridge 4 (Nunamaker, Tuttle, Kerns, Hollins); Steubenville 2 (Kausky, Criss). TRIPLES: Cambridge 1 (T. Valentine); Steubenville none. HOME RUNS: none. RBIs: Cambridge 7 (Hollins, Tuttle 2, Valentine 2, Moore 2); Steubenville 1 (Kausky). JOHN MARSHALL: Bratton (LP, 2IP, 9R, 8ER, 5H, 2K, 5BB), Pratt (2IP, 1R, 1ER, 6H, 1K, 0BB) and McCool. CAMBRIDGE (8-5): Perkins (WP, CG, 0R, 0H, 2K, 0BB, 1HBP) and Brumfield. TWO OR MORE HITS: John Marshall none; Cambridge (Moore 3, Kerns 2). DOUBLES: none. TRIPLES: none. HOME RUNS: none. RBIs: John Marshall none; Cambridge 8 (Hollins 2, Moore, Cork, Perkins, Brumfield 3). JOHN MARSHALL(7-13): Dobbs (2 2/3IP, 5R, 4ER, 6H, 0K, 4BB), Korngiver (LP, 3 1/3IP, 2R, 2ER, 1H, 3K, 2BB, 1HBP) and McCool. STEUBENVILLE (8-5): Cunningham (2 2/3IP, 4R, 4ER, 8H, 1K, 1BB, 3HBP), Zorne (2/3IP, 2R, 2ER, 1H, 2K, 2BB), Duggan (WP, 2 2/3IP, 0R, 2H, 1K, 0BB) and Criss. TWO OR MORE HITS: John Marshall (Wiley 2, Schramm 2, Black 2); Steubenville (McCoy 2, Bickerstaff 2). DOUBLES: 3 (Wiley, McCool, Schramm); Steubenville none. TRIPLES: John Marshall none; Steubenville 1 (Bickerstaff). RBIs: John Marshall 5 (Wiley, Schramm 2, Black 2); Steubenville 6 (Bickerstaff 3, Savage 2, Criss).